We allocate each donation to a specific net distribution as part of our desire to be highly transparent and accountable with each donation we receive. Donors can follow where the nets they fund are distributed. We now show, for each donation, the specific number of nets funded and an estimate of the number of people covered. Nets funded: We can be precise about the number of nets bought because the nets for each distribution, and indeed for each location within it, have a specific cost. The cost typically ranges from US$2 to US$3 as there can be a different mix of nets chosen (net type, size and brand) for a particular location within a distribution. 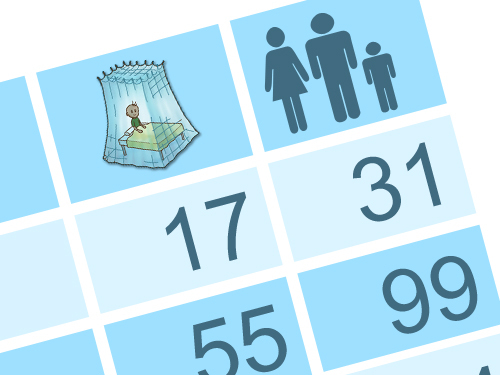 People covered: The estimate of the number of people protected is the number of nets multiplied by 1.8. This is the ratio usually seen in a large scale distribution. If a donation has not yet been allocated to a distribution, we use the current average cost of a net to estimate the number of nets the donation will fund. Columns for the number of nets and people covered are shown on public pages listing donations (e.g. list of all donors and sponsors, fundraising pages) and on private pages (personal donations pages).